iPad controlled LED art is so much cooler than boring paintings on canvas. 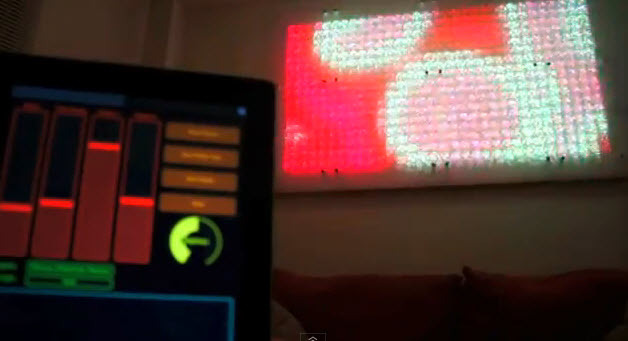 A computer scientist in San Francisco, Greg Friedland, created the Aurora LED Wall, a 4×8 foot iPad-controlled and music-responsive LED board which morphs into a digital light show. Unfortunately, this iPad controlled art board is not for sale. However, Greg posted the build details so you can create your own. He also provided the iPad software code which controls the LED art board so you can pick up where he left off and build your very own iPad controlled LED wall art. If you are crazy enough to take this project on and build your own iPad controlled art, please post a comment about your project. I would love to feature your work on this site.